The corrupting influence of mass media in a capitalist society has been the focus of several films. Most of these concentrate on the medium of television, famously exposing the manipulation of opinion and emotions for profit are such pictures as Quiz Show (1994), Network (1976), and Being There (1979). 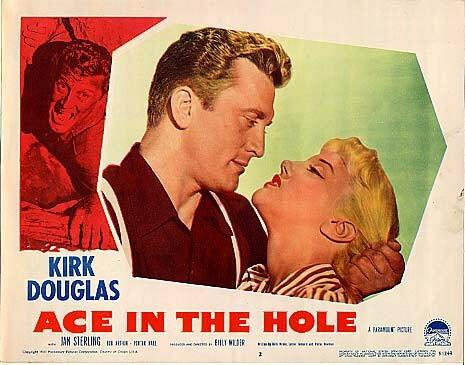 Predating all of these however is a 1951 production directed by Billy Wilder that examines the newspaper business entitled, Ace in the Hole. Kirk Douglas stars as a hard-driving reporter detoured to New Mexico after a string of mishaps at large papers in the East and Midwest. His relationship with the truth is casual at best and his stock in trade is the sort of sensationalist schlock the bourgeois press was built on. Intrigued at the idea of increasing circulation by picking up an experienced reporter at a bargain price the editor of a small town paper offers him a job, but before long, Douglas finds there is little news to cover, or even invent. Douglas gets a break when en route to the less than glamorous beat of covering a rattlesnake hunt, he stumbles upon an Indian artifact collector trapped in a cave. The Douglas character quickly calculates it will take at least a week for him to milk the story for all it’s worth. He realizes he can turn what would have been a one day human interest story into a media sensation. One that he will carefully control and use as his ticket back into employment with the major dailies. The actual rescue of the trapped victim would be a fairly straightforward procedure but Douglas conspires with the local Sheriff and a contractor to promote the idea of reaching him via a circuitous route that will take considerably longer. He persuades everyone that if they cooperate with his scheme they will get what they want. The Sheriff will get votes, the trading post located next door will sell hamburgers and souvenirs. With the plan in place the floodgates are opened and a brigade of salivating reporters from the big papers swarm in and camp out at the site. With each passing day they eagerly wait for each bit of information on the rescue that Douglas carefully lets out bit by bit. The Sheriff having already agreed to keeping the other reporters at bay for “safety reasons”. The supposed rescue effort becomes a tourist destination in addition to being a media circus. Another willing participant is the trapped man’s wife. She is bored with a life that is little more than being a glorified waitress at the trading post and domestic drudgery with a desert backdrop has long since lost it’s ability to charm her. And it isn’t enough that Douglas corrupts what is left of his own ethics, he warps a young copy boy from his paper into a sickening version of himself. Ace in the Hole follows the traditions of American film noir with crackling dialogue and a cast of characters that is utterly irredeemable. Even the man trapped in the cave is in reality little more than a grave robber who pinches earthen Indian jars to which he has no right, for his own profit.